Hilde Soliani Luce A brand new day ! Some months ago I tested many Hilde Soliani fragrances. I really loved scenting these perfumes as they are so different from other fragrances I have tried before. Hilde Soliani is an Italian perfumer with a passion for teatre and Italian haute cuisine. The Hilde Soliani Facebook page shows her many times near a master chef and helping him with his cooking. Hilde Soliani has 4 different perfume lines. Profumo e gusto in liberta was inspired by haute cuisine dishes. Teatro Olfattivo di Parma was inspired by local theatre in Parma. Ti amo was inspired by flowers and Gli Invisibili was inspired by emotional events in her personal life. Some bottles might seem a bit odd. At first I was put off a bit by the bottles of the Gli Invisibili line with a crucifix on them. What struck me most about Hildes fragrances was the joy they brought me and probably the pleasure of Hilde making her fragrances. They are different from anything I have tried before, very original and fresh. Their structure does not seem very complicated. They do not change a lot on my skin as other perfumes might do. But their simplicity might be deceiving. They are really well made. Hilde is very original in her combination of scents like strawberry and salt in Fraaagola Saalaaata and custard cream with cherries flavoured leaves of tobacco in Doolciiisssimo. One of the fragrances I enjoyed most was Luce of the Profumo e Gusto in Liberta line. Luce means light in Italian and was inspired by the birth of a child of a friend of Hilde, a new born child bringing light to the earth and joy to the ones around him/her. Personally I would find it more logical if Luce would have been in the Gli Invisibli line, a liquid emotion and not in the haute cuisine line. Luce is all about powder, baby powder. Somehow it reminded me of the almond coated sweets given to visitors when a child is born in Spain and maybe other countries too. It would be very suited to scent a birth announcement card with Luce. Hilde Soliani keeps her notes/ingredients secret like a master chef who does not convey his recipes. The emotion Luce brought me was of pure joy, the same pleasure I experience while watching the scene brand A brand new day (everybody rejoice) in the movie The Wiz (1978). But at the same time Luce is very relaxing and comforting. A very interesting combination, bringing delight and cosiness at the same time. Luce is sold in a 100 ml bottle. I really wish Hilde Soliani would introduce a discovery set of her fragrances or smaller 30 ml bottles as Parfums de Nicolai does. Swiss perfumer Andy Tauer recently introduced an explorer set and the French perfume brand Jul et Mad small 5 ml bottles. A sample of Luce was provided for pr purposes. This did not influence my review. 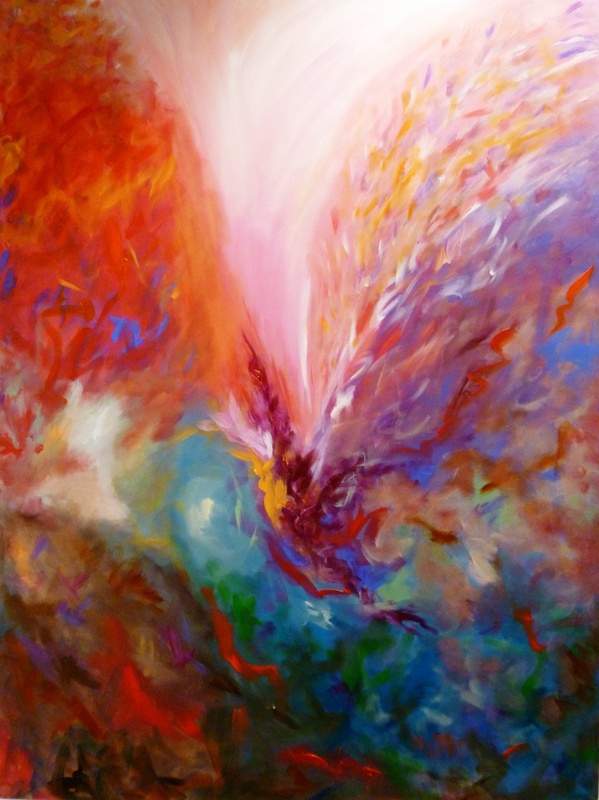 Paintings Taking flight 2011 and Birth 2010 are both made by Henriette Hackenberg. Thank you, Hilde. I am glad and honoured you read the review.